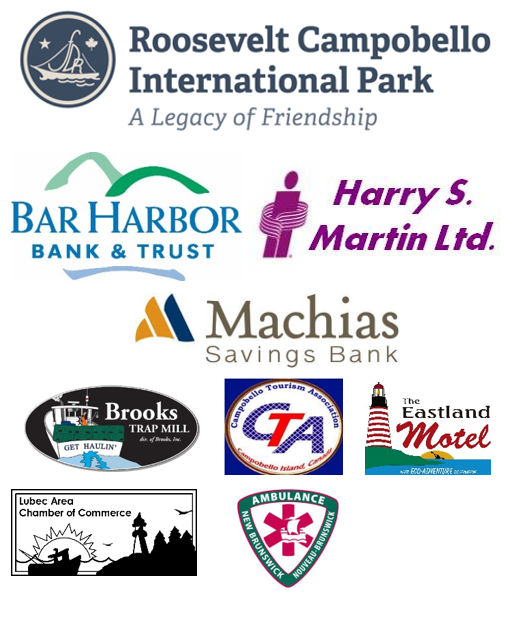 Title and Presenting Sponsors: whose name is associated with every major usage of the element being supported–such the Roosevelt Park Bay of Fundy Half-Marathon which recognizes the Roosevelt Campobello International Park, the Bar Harbor Bank and Trust and Machias Savings Bank 10K. Champions: whose support is limited to smaller, more specific items such as Race Support by Harry S. Martin and Refueling by Bar Harbor Bank and Trust. Friends: who are recognized on Finish Line banners. Contributors: who are identified on sponsored mile and km markers along the course. Canada: Carole Joy, 506-752-2684. USA: Maureen Lord, 207-733-4931.